Want to take fabric (or pretty paper) and give it a whole new purpose? 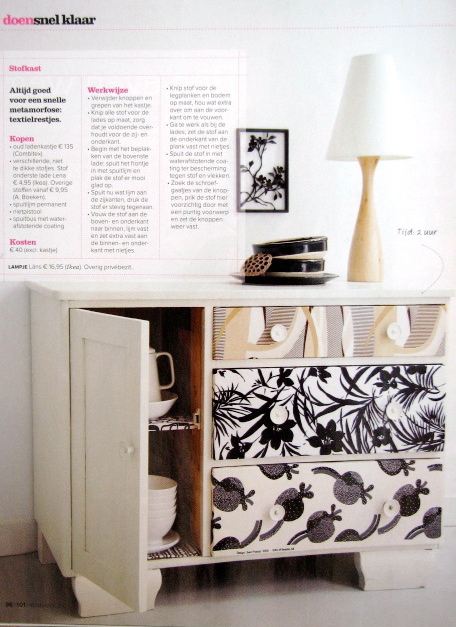 How about applying it to the front of a dresser as shown here in 101 woonideeen magazine date November '07? I've had this on my inspiration board for a few months, I'm dying to pick up a piece like this and experiment with some fabric and spray adhesive. I'd also like to try cutting out floral patterns from fabric, stitching the edges, and doing some furniture applique work... Maybe apply a floral cutout up the side of a cabinet in an entryway for instance. Imagine painting a dresser like the one shown above in red lacquer or teal and then up one side, apply a large floral motif cut from fabric? Wouldn't that be wonderful? Maybe only to me because I'm a little left of center sometimes, but I think it would look great. I'd like to start collecting issues of 101 woonideeen but cannot find them in the states. It's the best magazine ever, and I do mean ever. Even better than Livingetc and Elle Decoration because the things featured are so attainable, it's packed with DIY projects that don't involve Chex cereal boxes, pipe cleaners, or tin cans but really chic things that give you a chance to put on your pink toolbelt and have some fun. I wish we had a magazine just like it here - we really need something like this. Badly.